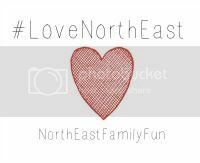 Welcome to July's #LoveNorthEast - a huge thank you to everyone who continues to join in with our North East blogger linky. I will be sharing some of my favourite posts from last month on facebook this month so keep your eyes peeled. I especially loved this post detailing how to stop faffing and get stuff done! It has actually inspired me to start an accountability group amongst some of my mumpreneur friends. I also loved reading about Bierrex from All About Eats - I really want to go now!